The Rockwood Hard Side High Wall pop ups for sale here at Vermont Country Campers are the perfect blend of comfort and convenience. Therefore, the next time you want to take your family on a RVing trip, make sure you look into the many features included on this camper that are intended to add convenience for a better, more relaxing vacation. 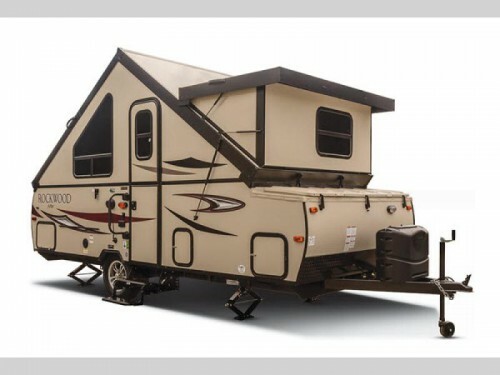 Get comfort and ease of travel with our Rockwood Hard Side High Wall pop ups. As with any pop up, the Rockwood Hard Side High Wall is designed to pop up and down depending on whether or not you are using it. The easy pop up mechanisms can take it from a flat trailer to a fully equipped A-Frame camper. 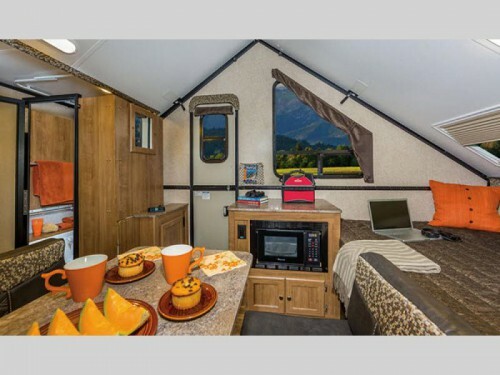 Inside, you will have everything you need to be comfortable at the campsite including a full kitchen, deluxe memory foam and heated controlled mattresses, and some will even come with a private bathroom closet! Easily pops up into a large A-frame camper. 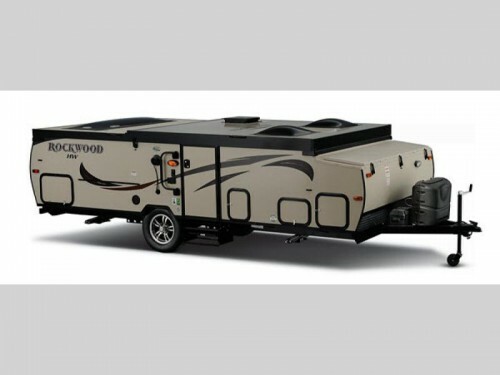 When this Rockwood pop up is in travel mode, it is going to be one of the easiest options to tow. The compact design is meant to be lightweight enough that you will not need a huge vehicle to tow it. Plus, the aerodynamic design helps eliminate wind resistance to increase the gas mileage you will get, so you can save money by not only using a vehicle you already have to tow it but also on the gas you will purchase getting to your destination. The compact design is easy-to-tow and store. The size of these campers when they are popped down will allow you to find easy storage solutions when you are not using them. The length and height at such that they can be stored inside a garage while still allowing more space for another vehicle. You will never have to worry about leaving it out in the weather where it can get damaged, so it will always be ready to go on your next camping trip. Rockwood Hard Side High Wall pop ups will provide the comfort and safety of a travel trailer in a compact design that is easy to care for and travel with. Contact us today to find out more or just come down to our location and take a look at them for yourself.